Have you ever wondered what Bisphenol A (BPA) — a chemical linked to cancer and found in food cans and plastics — would look like and how it would behave if it were a person? Meet the characters of The Toxies, a non-profit multi-media campaign to protect communities, workers and the environment from toxic hazards. 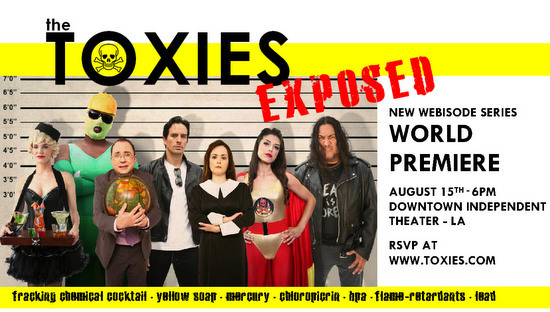 On August 15, 2013, the Toxies campaign will premiere The Toxies: Exposed, a 7-part satirical video series that follows a daring investigative journalist as he chases down toxic chemicals and pollutants from farm fields to car washes. This theatrical exposé brings toxic hazards to life to help illustrate the dangers we face without regulations that prevent exposures, and threaten our health. Every year millions of pounds of toxic or untested chemicals are used in the U.S.
“Failed chemical policies are leading to unwanted chemicals in our bodies. Almost every week a new study is released that highlights the link between chemicals in our environment and a wide range of health problems from cancer, developmental disorders, infertility and more,” says Martha Dina Arguello, Executive Director of Physicians for Social Responsibility-Los Angeles. Right now, Congress is considering a major overhaul of the 1976 Toxic Substances Control Act (TSCA), our nation’s main law regulating toxic chemicals. But rather than fixing the problems with TSCA, the current proposal — The Chemical Safety Improvement Act (CSIA, S. 1009) — is backed by chemical manufacturers and fails to protect public health and the environment. Public pressure is growing to amend the bill immediately. The Toxies: Exposed video series aims to quickly bring people up-to-speed on one of the leading issues of our time. In fact, many of the “stars” have become household names, especially for those who have been affected by these hazards. For example, Fracking Chemical Cocktail is a mix of 600+ toxic or unknown chemicals pumped into the ground as part of fracking, a controversial technology used to extract oil and gas. “Fracking has been linked to air and water contamination and earthquakes. Yet, the fracking companies have been able to run their operations without having to prove the process is safe. How can we keep our water safe when energy industry dollars trump public health?” says Sophie Noero of Worksafe. The August 15th premiere will provide include the opportunity for audience members to engage with a panel of scientists, health professionals, workers, and consumer advocates. Watch the whole video series now at www.toxies.com/exposed, and in Spanish at www.toxies.com/exposed-espanol. Bisphenol-A: A chemical used in can liners, reusable plastics, receipt paper, and other products; disrupts the endocrine (hormone) system, increasing risk for cancer and other reproductive harm. Chloropicrin: A fumigant pesticide used in agriculture, known to drift off of fields and poison communities and workers. Flame Retardants: Added to consumer products, released in household dust, and increases toxic smoke/soot in fires; linked to many health effects including increased cancers for firefighters. Lead: A heavy metal still causing childhood lead poisoning; is found in housing, consumer products and factories that emit lead, pollute air in communities and put workers at risk for lower IQ and brain damage. Mercury: A heavy metal polluting the air through coal burning and other manufacturing; travels through the air and waterways, building up in the environment, wildlife, and people; causes brain and nervous system damage. Yellow Soap: A product used in car washes and linked to blurred vision, chemical burns, dizziness and unknown long-term health effects, violating worker safety and health. Martha Dina Argüello, Executive Director, Physicians for Social Responsibility — Los Angeles. Spanish/English bilingual. Cell: 310.261.0073, marguello@psr-la.org. Martha can address a variety of toxic chemical exposure issues — to communities of color, about educating physicians, and California’s history of chemical regulatory policy. Kathryn Alcantar, CA Policy Director, Center for Environmental Health. Spanish/English bilingual. Cell: 415-694-9596, kathryn@ceh.org. Kathryn can talk about state efforts to promote Green Chemistry and create an effective process to assess safer alternatives to toxic chemicals. She is the Campaign Director for CHANGE- a statewide coalition of almost 35 diverse organizations working to change chemical policy in CA for the protection of workers, children, and fenceline communities. Arlene Blum PhD, Executive Director and Founder, Green Science Policy Institute. 510.644.3164, Arlene@GreenSciencePolicy.org. Arlene can address halogenated flame retardants and the efforts toward Green Chemistry solutions. Kathleen A. Curtis LPN, Executive Director, Clean and Healthy New York. 518.708.3922. clean.kathy@gmail.com. Kathleen can address policy in various U.S. states on protecting environmental health from flame retardant chemicals. Ana Mascareñas, Policy and Communications Director, Physicians for Social Responsibility – Los Angeles (PSR-LA). 213-689-9170, cell:323-743-3241, amascarenas@psr-la.org. Ana can discuss the concept behind “The Toxies”, BPA, Flame Retardants and the proposed Chemical Safety Improvement Act (S.1009). Sophie Noero, Program Administrator, Worksafe. cell: 504-909-2697, snoero@worksafe.org. Sophie is available to discuss workplace and worker chemical exposure issues, and “green” and “blue” collaboration to advance chemical policy reform. Davis Baltz, Precautionary Principle Project Director, Commonweal, 510-684-7594, dbaltz@igc.org. Davis can address what the Toxies tell us about the widespread exposure of toxic chemicals to everyone on Earth, and why we need new laws that give us reasonable certainty of no harm from chemicals that are in the environment and our bodies.